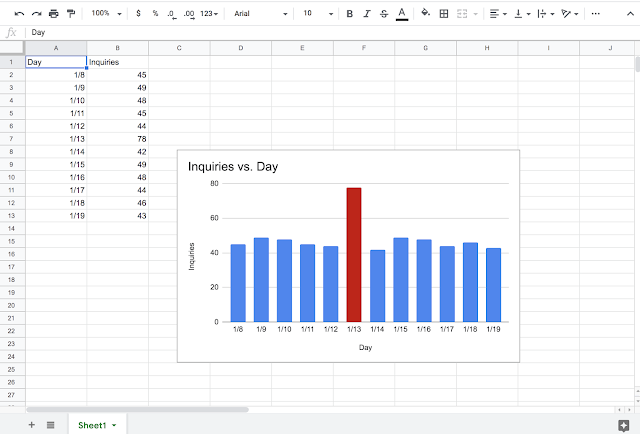 In an announcement that would have seemed at home in the year 1990, Google has announced that you can make a design element in your Sheets chart a unique color. For instance, in a bar graph where all the bars are blue, you can make one red (see above). Before you rush to your personal computing machine to try out that innovative new feature, though, note that there's another G Suite update coming as well. You can now embed a Google Drawings file into a Doc, and easily update the content of the linked drawing if and/or when it changes. To insert a Google Drawing, head to Insert>From Drive and select the image. The Docs feature is useful if you want to insert an image into a document that needs continuous updating - all users have to do is click the "Update" button in the upper right hand corner of the embedded drawing and it will bring in the changes made to the source file in Drive. The Sheets feature is useful if you want to make some parts of your chart different colors. Both are small but useful updates that push G Suite's set of functionalities just a little bit further forward. Considered alongside the recent December Drive beta update that introduced the ability to share docs with non-Google account holders, the Google Drawing embed feature seems like a particularly useful tool for interfacing with collaborators. Both features are available to all G Suite editions. The rollout for both begins today, January 7th, though it may take 15 days or more for the embedded drawing feature to show up, while the color design element feature should pop up within one to three days.